You might meet one day one of the three street Nero that George Brown made in the late fifties although these are extremely rare. Here is the story of one them, usually nicknamed the “French Nero” because owned by the Frenchman Marc Bellon. Marc was the owner of a Rapide that had a serious propensity to wobble at high speed. Thus, when one of these road rodeos ended in a crash, fortunately minor for him and the bike, Marc decided to pay a visit to George Brown, convinced that the Nero architecture will sort out his bike issues. Marc likes to tell that Georges said he was completely crazy and also perhaps because he turned up with his Rapide at Brown’s shop, George accepted to build a Nero replica for him. About a year later, the bike was ready, and as you could expect, the result was close to Brown’s racer. 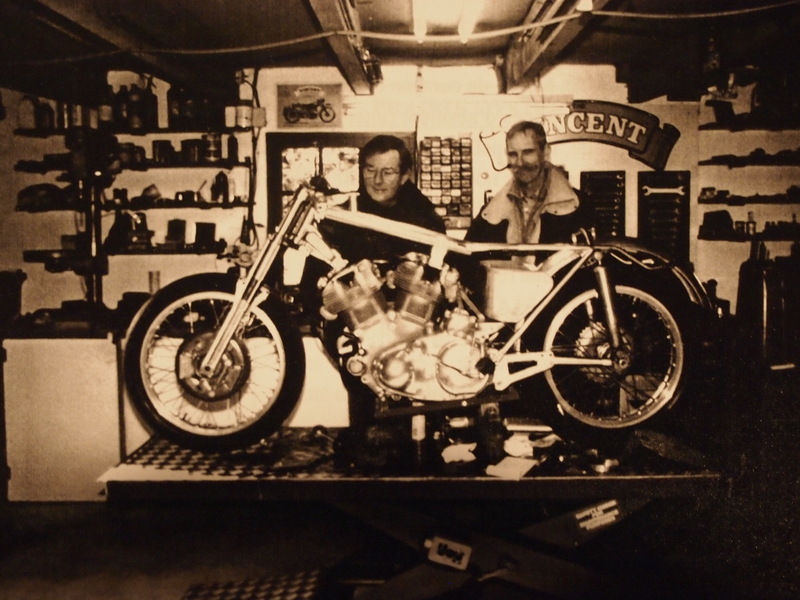 The all-front end had been replaced with an AJS 7R telescopic fork and conical brake, both wheels being wired with 19in aluminum rims. 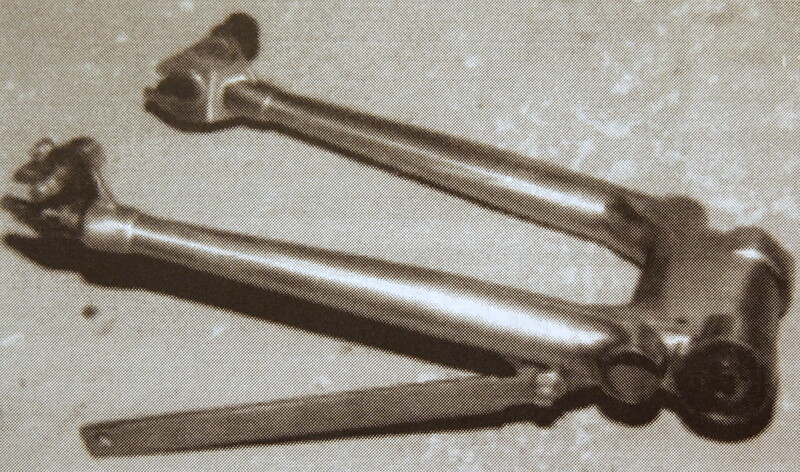 On the back end, a tubular sub-frame supporting the Velocette-based swinging arm, and Woodhead Munroe shocks were replacing the Vincent RFM (1), while the UFM (2) was preserved in the operation. In this configuration, the bike was significantly lighter than a stock Rapide (3). Two more Nero Replicas were subsequently built on this model by George Brown: one for a Scottish physician and the other one for a merchant of Eastbourne, all 3 bikes having a stock engine. Although, demand was coming steadily, George never had the time to accept new orders, maybe because he was already moving into his new project: designing and building Super Nero. 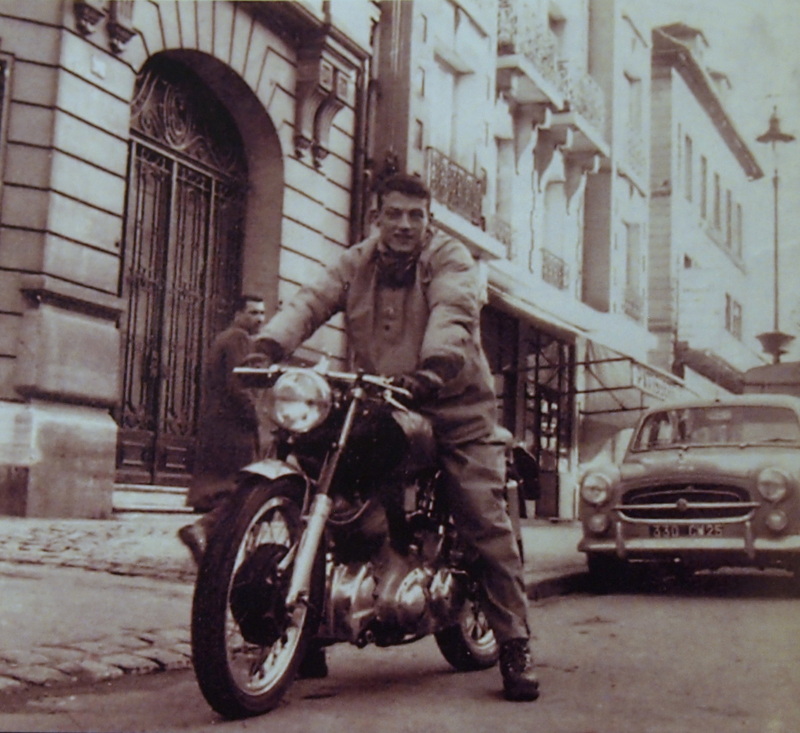 Back in France, Marc covered 10,000 miles before he was called on duty in the Algerian events (4). His friend, Marc Souvrain, was entrusted to take care of it, but when Marc came back, he found his bike in a non-running poor state of repair in which it remained for about 20 years. 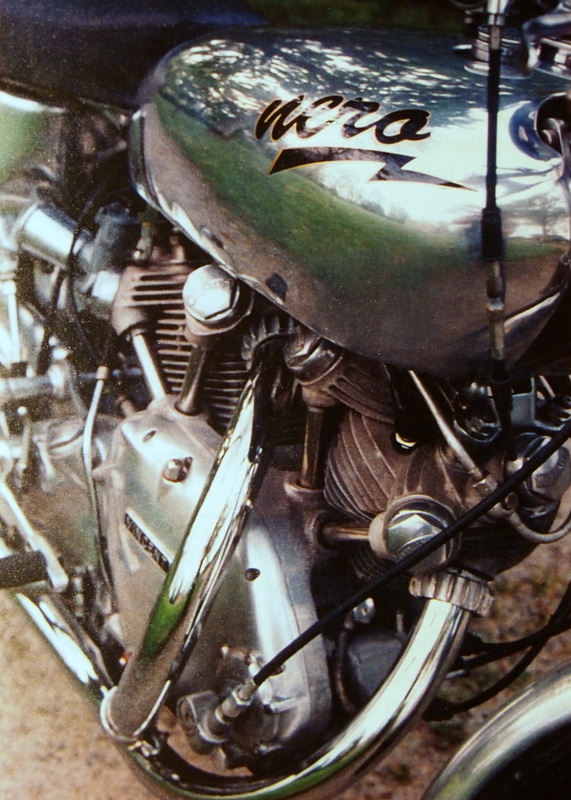 From the mid-80s, started a long process of restoration, long because Mark also wanted to improve the functionalities and the look of his bike: his vision was a combination of unpainted surfaces made of polished aluminum and chrome-plated parts. The engine was sent to Herve Mocard, who rebuilt it completely with Mahle pistons, MkII cams, Alton generator and ported heads to fit the 30 mm concentric carburetors. 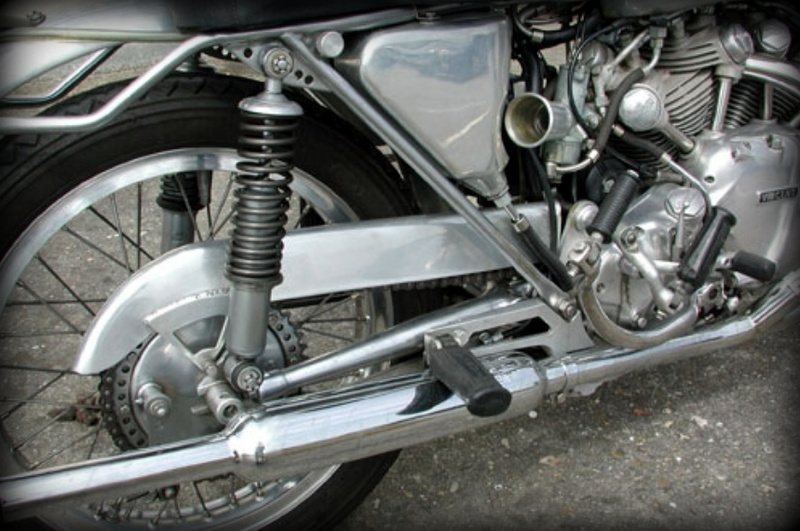 The main structural modification was the replacement of the Vincent UFM by a custom-made backbone consisting of a large diameter tube to which a solid billet steering head is bolted. Eventually, Francois Grosset had the mission to put all these parts together and not only make the bike functional, but also meet Marc’s objectives in terms of finishing and details. On that perspective, particularly mention goes to: the “Nero style” aluminum tank, the horse-shoe aluminum oil tank fitting the rear frame properly (5), and various interesting parts made of aluminum such this rear chain case or headlamp and footrest brackets. Completing the picture were a lightweight Yamaha clutch, a Grosset electric start, a Feridax seat and a 5” shadow clock along with a Smith rev counter were adapted to the bike by Francois. The restoration process completed in 1998, more than 35 years after Marc found his bike broken in crates. Was he satisfied with the result? You bet he was! This French Nero is indeed incredible in quality of the execution and is also extremely well balanced in its proportions. The bike is even lighter at 160 kg (353 lbs) and handles extremely well with its new UFM. Marc has enjoyed riding his Nero until 2009, date it was sold to a customer it in the UK. Captured in Paris, in the late 50s, Marc Bellon just came back from George Brown’s shop with his Nero replica. 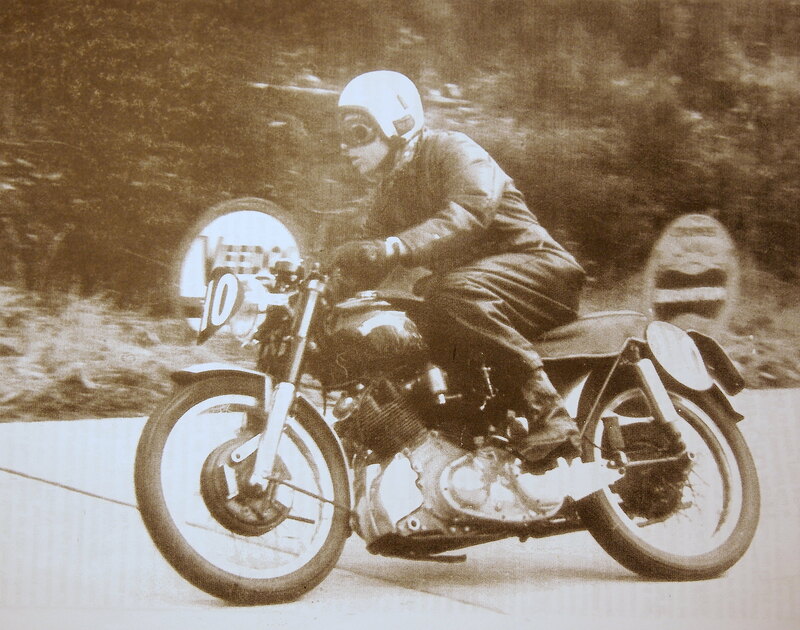 Marc Souvrain riding the French Nero at Cote L’Apize hill climb in 1960, where he made the best time. The French Nero today. 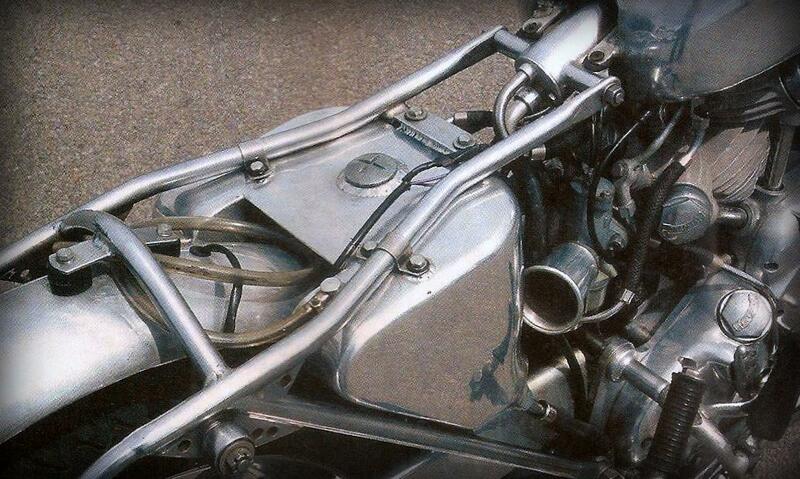 The front fork and brake came from an AJS 7R and are part of the original installation made by George Brown. 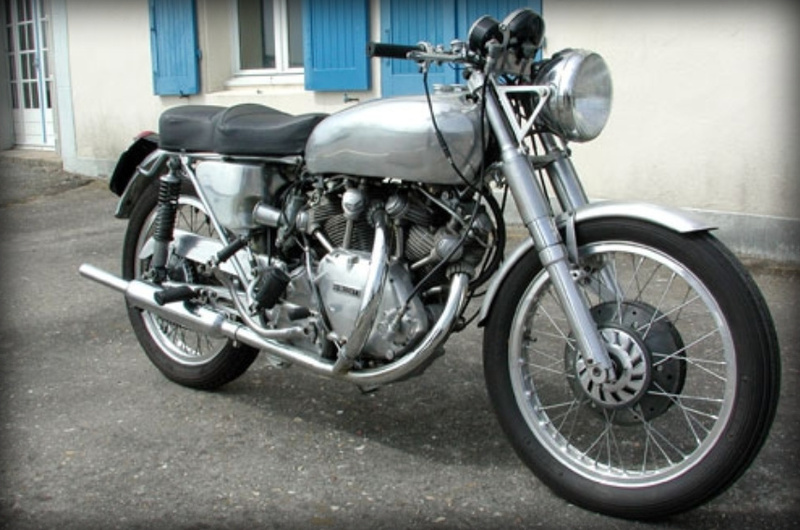 Brown was leading the Experimental department and had no authority on the design of the Vincent, should he had it, he would surely had swap the Girdraulic and the cantilever for these conventional elements and the result would have been close to this Nero. Another interesting picture taken by Francois Grosset shows the new UFM, which replaced the stock RFM untouched by George Brown. 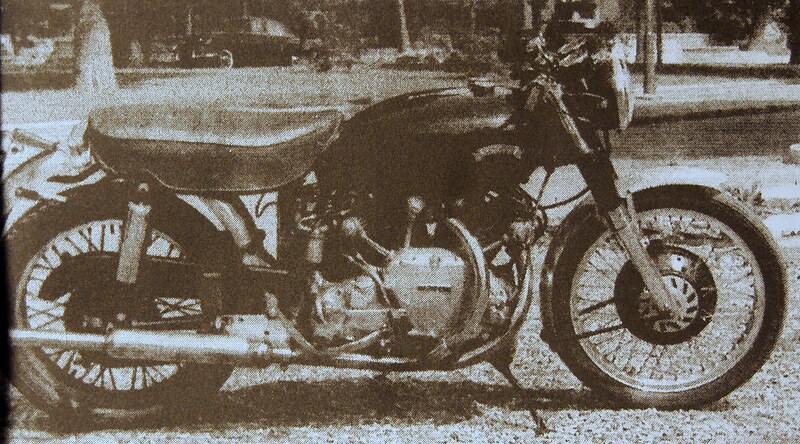 Note the typical Velocette swinging arm with its tapered tubes similarly to a racing bicycle. Unlike the Egli, the lack of vertical tube opens space around the engine. A big thanks to the French section of the V.O.C. who helped me to assemble this documentation, particularly Serge Vollard (a.k.a Raspoutine), Jean Pirot, Francois Grosset and Dominique Malcor. (4) These events lead to the independency of the Algeria, July 5, 1962. (5) Originally Marc wanted to make the new UFM functional as the Vincent design. However down the road, he decided to add this Aluminum oil tank that fits perfectly the bike and thus converted the top tube as a drainable catch tank for the engine breather. Glenn Shriver asked me to try and replicate this, in stainless, for his Stainless framed Egli (Geratric Hooliganism). I should have tried harder ! See page 49 of THE MOTOR CYCLE , 8 January 1959 , for photos and text. 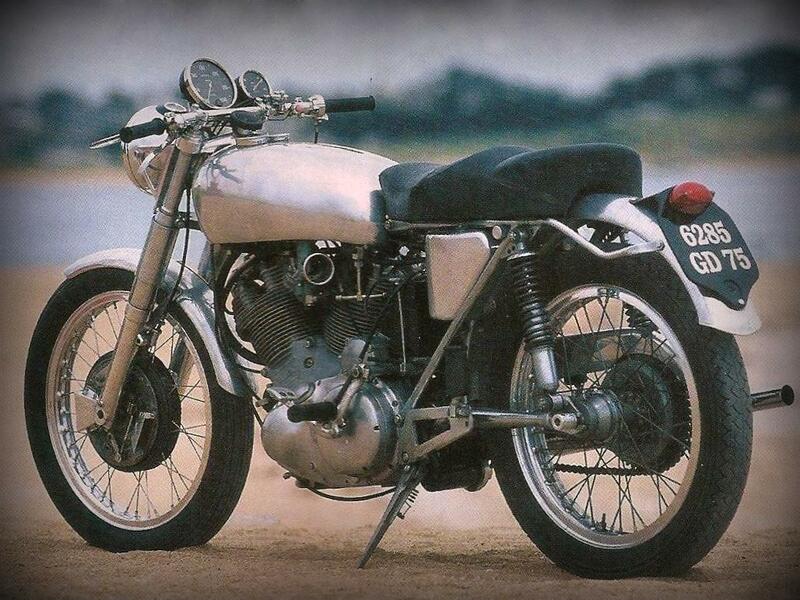 I once owned a George Brown Special Vincent EJN188.It was built in 1959 standard Black Shadow engine&gearbox.I bought it in 1962,&sold it in1970.I now ride a Buell1125cr YJ59KWX.I wish i had kept the Vin,but we all make mistakes!Dave Watling ps,who owns the Vin now? Dear Dave I know you! Your name is on my Vinnies log book. I bought her in 1971 and still ride her I Have 35 bikes but this one is a thing apart. Currently i am in up country India with intention of returning to Aus in June. I will contact you again subsrquently. Thank you so much for responding it is so excited to find out about her after all this time. Kind regards Richard P.s I still have the original number plate. Hello Richard,im really pleased to hear from you.Im sure the#wasEJN188.I often think of her,&deeply regret selling her!Did you buy her from Ron Owen-Pullen?I bought her from him,&after about8years,sold her back to him,to buy a boat.I now ride a Buell1125cr.I envy you all your bikes,but i must say,im very fond of my Buell.I hope you continue to ride many happy miles on the Vin.Best regards,Dave Watling. Sorry did you get the below message? If can help me please feel free to email me on faulk@iinet.net.au. Thank you.